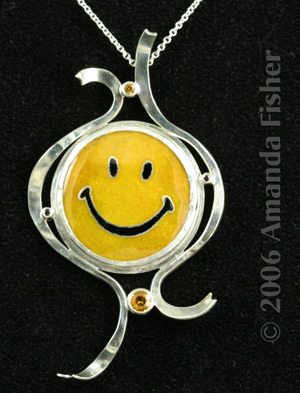 Created for a juried show about the Smiley Face, I wanted to do a very straight, conventional version of the smiley itself, and put it in a more elaborate setting. The original inspiration for the overall look was Art Nouveau, along with wanting to emphasize the playfulness of the image. Glass enamel and fine silver wires on a slightly domed, textured fine silver base, fired multiple times. Fine silver bezel on a pierced sterling base, with sterling settings and forged dimensional sterling "ribbons". Sterling and fine silver, glass cloisonné enamel, yellow sapphires, black diamonds. For Sale: $700 US. Please email me for details. Below: details of the back of the piece.